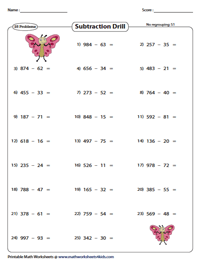 Get students of Grade 3 and above to find the differences between 3-digit and-2-digit numbers with this assembly of worksheets that are split into vertical and horizontal formats. Learners need to apply concepts of regrouping and no regrouping to solve the problems. 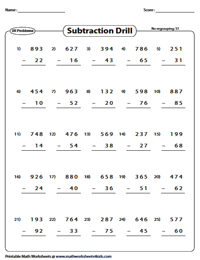 Subtraction drills across all sub-topics are segregated into 25 or 50 problems per page to facilitate easy downloads. Find the difference between the 3-digit and 2-digit numbers that do not require regrouping. Validate your solutions with the help of the answer key. 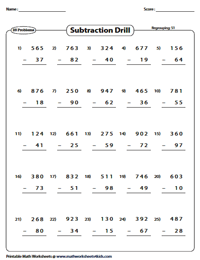 Set the timer and race against time to complete this set of horizontal formatted subtraction drills! 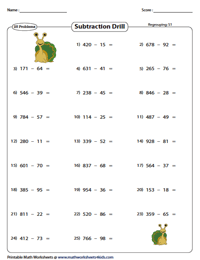 These printable worksheets focus on 3-digit and 2-digit subtraction without borrowing. Use the download option to help young learners master these vertical subtraction drills with a stopwatch in hand! All the problems featured in this series of ready-to-print worksheets require regrouping. This series of regrouping worksheets available in 25 and 50 problems per page. The problems are positioned in the horizontal form. Free worksheet is included.